Western blot analysis of extracts from A172 and MCF7 cells using Akt3 (E2B6R) Rabbit mAb (upper) and Akt (pan) (C67E7) Rabbit mAb #4691 (lower). 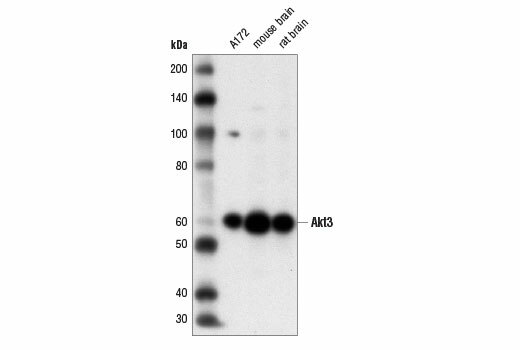 Western blot analysis of extracts from A172 cells, mouse brain, and rat brain using Akt3 (E2B6R) Rabbit mAb. Immunoprecipitation of Akt3 from A172 cell extracts using Rabbit (DA1E) mAb IgG XP® Isotype Control #3900 (lane 2) or Akt3 (E2B6R) Rabbit mAb (lane 3). Lane 1 is 10% input. 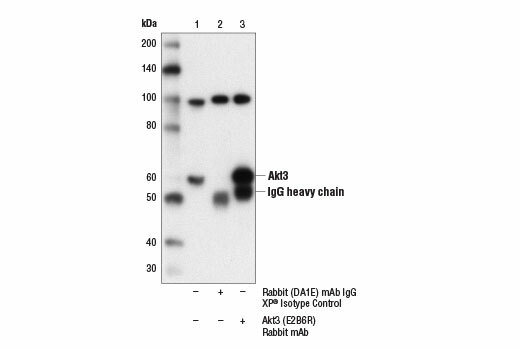 Western blot analysis was performed using Akt3 (E2B6R) Rabbit mAb. 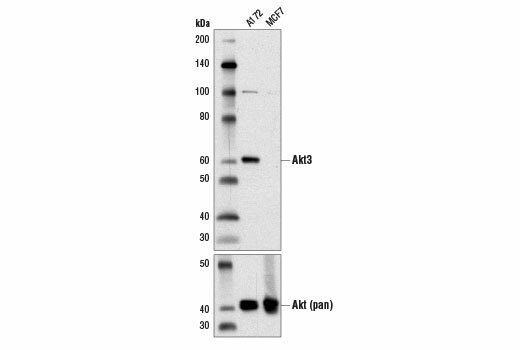 Akt3 (E2B6R) Rabbit mAb recognizes endogenous levels of total Akt3 protein. This antibody may also cross-react with an unidentified protein of approximately 100 kDa. Monoclonal antibody is produced by immunizing animals with a synthetic peptide corresponding to residues surrounding Asp126 of human Akt3 protein.